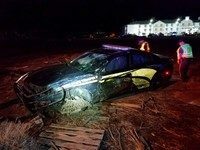 Redmond, OR – On April 11, 2019, at approximately 11:34 PM, Redmond Police, and Fire personnel were dispatched to a reported rollover vehicle crash involving an on-duty Oregon State Police Trooper in front of Motel 6 on S Hwy 97 in Redmond. Officers arrived and found two vehicles involved in a collision. Redmond Officers discovered the OSP Trooper was still inside his marked patrol vehicle, which was resting on the driver side in a nearby vacant lot. Officers also contacted the other driver involved, Mr. Christopher Luna a 42-year-old male from Arizona, at the crash location. The highway was closed for a short period of time due to the amount of debris on the highway. The Oregon State Police Trooper was transported by fellow OSP Troopers to St. Charles Medical Center where he received treatment for non life-threatening injuries. Mr. Luna was evaluated by medics on scene.